Planned Legacy creates engaging and inspiring donor walls and interactive recognition displays that can become key destinations at your facility. These high-impact displays strengthen relationships, build awareness and promote increased giving and participation. While we specialize in designing recognition displays that feature interactive multimedia presentations, we can also help you capture the culture and vision of your organization with beautiful and inspiring traditional donor walls that are practical - meaning easy and economical to update and add donor names - without compromising aesthetics, imagination or budget. Our electronic donor walls and interactive recognition displays attract, inform, inspire and motivate donors, visitors, volunteers and staff at first point of contact. Our space-saving, easy-to-update multimedia presentations allow you to keep your current and important messages in front of your community when it counts. Multimedia presentations are limited only by your imagination and can include donor profiles, organizational highlights, donor recognition, new fundraising projects, historical video, giving opportunities and more. Integrated donor recognition displays truly provide the best of both worlds, blending the tradition and presence of static donor walls with vibrant multimedia displayed on LCD displays or touch-screen kiosks. 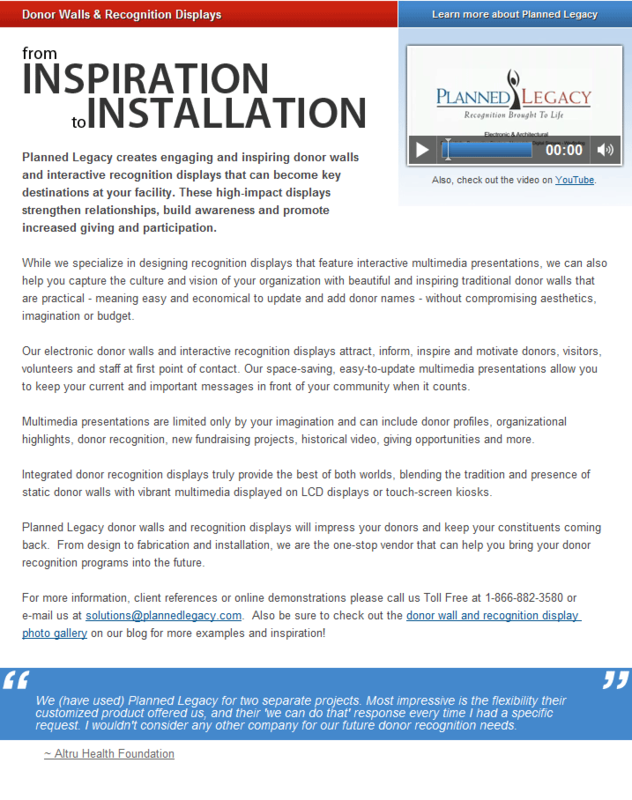 Planned Legacy donor walls and recognition displays will impress your donors and keep your constituents coming back. From design to fabrication and installation, we are the one-stop vendor that can help you bring your donor recognition programs into the future. photo gallery on our blog for more examples and inspiration! We (have used) Planned Legacy for two separate projects. Most impressive is the flexibility their customized product offered us, and their 'we can do that' response every time I had a specific request. I wouldn't consider any other company for our future donor recognition needs.